Summer was made for the enjoyment of wine – either cooling down with a chilled white on a hot day, or savoring a particularly beautiful sunset with a robust red. When you’re sampling these delights, it helps to be in the area that created them, their “terroir,” so that you can taste and understand the different complexities in the wine and where they came from. Savor the summer with these tasty wines, each one perfect for a different summer occasion and mood, and all of which are made right here on the Central Coast. This wine is a red blend composed of 85% Cabernet, 10% Merlot, and 5% Syrah from the El Pomar, Creston, Estrella, and Geneseo sub-AVAs of Paso Robles – microclimates within the larger Paso Robles and San Luis Obispo American Viticulture Areas. You can sense the diversity in the microclimates as you sip this wine at the tasting room at Liberty school or in the privacy of your own balcony. It has notes of black currant crushed blackberry, eucalyptus and cinnamon, along with flavors of dark berries, cherry, and toasted oak. The perfect summer blend that represents a variety of Paso Robles unique microclimates, this Cabernet is ideal for a enjoying on a warm late afternoon. What is sweeter and cooler than a crisp rosé? Halter Ranch Vineyard, a Paso Robles estate winery with limestone soils that produce high quality white and red blends, offers a magnificent rose that is perfect for capping off a summer dinner. Marvel at the beautiful light coral hue of the wine, and taste its delicious fruity notes of wild strawberry, watermelon, and kiwi. The sweet taste will leave you refreshed and wanting more. Tablas Creek Vineyard and winery is the combination of decades of work from two families, combining to form a limestone-rich and organic vineyard on over 120 acres of Paso Robles hills. Their specialty is Rhone Varieties, and their white blend, the Vineyard espirit de Tablas Blanc is a luscious, honeyed white blend that indicates their terroir and their expertise in the Rhone variety. The wine is balanced, with a fascinating combination of rich and very dry; its remarkable and unique flavors make it a wine to enjoy in the company of other wine lovers, perhaps on one of Paso Robles famously cool sun-downs. 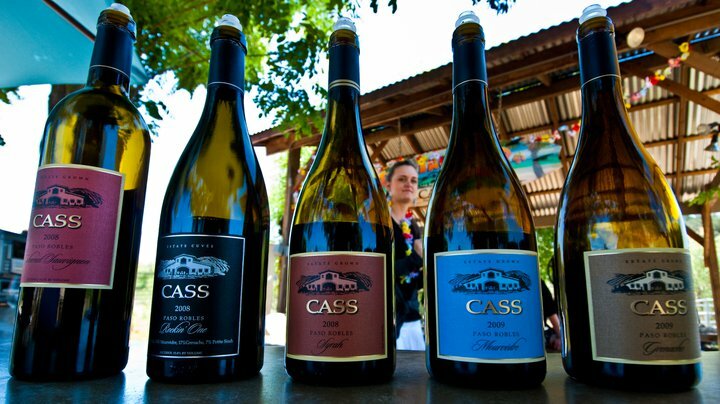 Cass Winery is a great place to stop in Paso Robles, with an on-site restaurant and many different wines to try. But the 2013 Rockin’ One Red Blend is one you should take home for the summer to enjoy again. A balanced and delightful blend of 41% Mourvedre, 29% Grenache, 24% Syrah, and 6% Petite Sirah evoke a variety of aromas – from stewed boysenberries, dried rasperry, pipe tobacco, clove, and orange dress. With a soft feel and a bright acidity, the smoky yet crisp wine is perfect for that ideal outdoor summer barbeque, and is a wine you’ll want to enjoy again. Thankfully, you can, as Cass will be selling this popular blend until 2021. Viognier is a Rhone varietal that is currently on the rise in Paso Robles, with quality winemakers producing great richness and complexity of flavor from the grapes. Four Lanterns Winery’s white Viognier is usually crisp, with notes of pear and stone fruit, and a wonderfully rounded mouth feel. The winery recommends spicy food or poultry to pair with their viognier, calling up wonderful summer memories of the smorgasbord of food at summer bbqs. Share your wine tasting adventures with us this summer by tagging your photos with #central coasting. Happy sipping!